What’s New for the 2013 Lexus ES? The Lexus ES has been completely redesigned for 2013. The lineup also now includes the ES 300h hybrid model. The Lexus ES is a four-door midsize luxury sedan that boasts wide curves, aerodynamic angles, and a sloping front-end. The ES is a handsome car that turns heads on every corner with standard 17-inch wheels, LED running lamps, fog lamps, a sunroof, heated mirrors, and keyless entry and ignition. 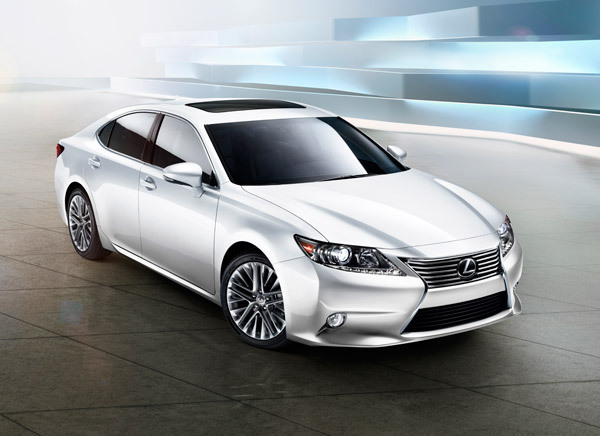 A 3.5-liter V6 engine powers the 2013 Lexus ES 350, creating 268 hp and 248 lb-ft of torque. Front-wheel drive and a six-speed automatic transmission come standard on the Lexus ES. Right in line with its competitors, the Lexus ES went from 0 to 60 mph in 6.5 seconds in Edmunds performance testing. The Lexus ES receives EPA-estimated fuel economy ratings of 21 mpg city, 31 mpg highway, and 24 mpg combined. The 2013 Lexus ES features an interior that’s more modern, sleek, and stylish than models of years past. The dash features modern technology, and is complimented by high-end, soft-touch materials, and wood trim. Controls are well-placed and easy to navigate. Interior space is plentiful, with especially impressive rear leg-room. Standard interior features include dual-zone automatic climate control, eight-way power front, a tilt-and-telescoping steering wheel, an auto-dimming rearview mirror, Safety Connect emergency communications, Bluetooth phone connectivity, and an eight-speaker sound system. The 2013 Lexus ES comes standard with antilock brakes, stability and traction control, front and rear side airbags, side curtain airbags, front knee airbags, and Lexus Safety Connect. In government crash testing, the 2013 Lexus ES received the top possible overall score of five stars, and similarly earned the highest possible rating of “Good” in the Insurance Institute for Highway Safety tests.